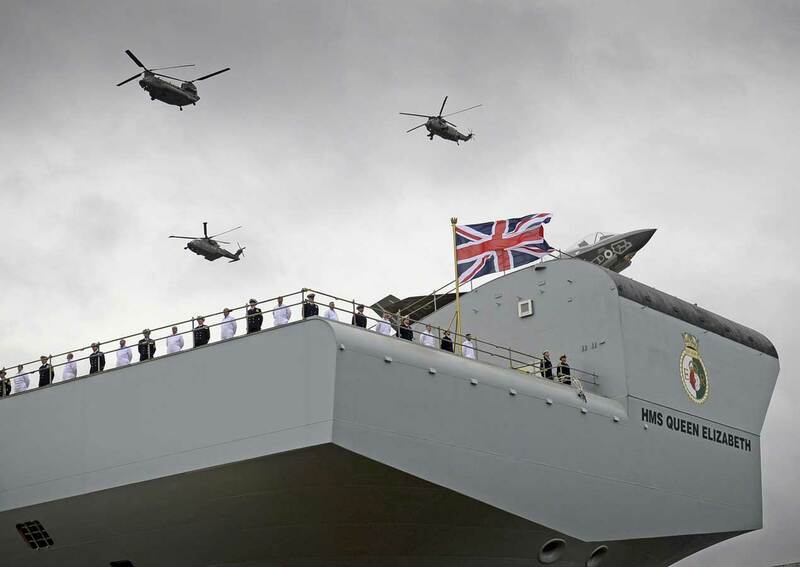 he Royal Navy’s largest warship ever constructed, HMS Queen Elizabeth, was formally commissioned into the Navy’s fleet today by her namesake, Her Majesty Queen Elizabeth. “HMS Queen Elizabeth embodies the best of British technology and innovation, a true flagship for the 21st century and the most powerful and capable ship to raise the white ensign,” Her Royal Majesty stated at the formal commissioning ceremony in Portsmouth on the 7 December. HMS Queen Elizabeth's Commanding Officer, Captain Jerry Kyd, said decades of work by the UK’s maritime and shipbuilding industry had come together with the Ministry of Defence to deliver “this magnificent ship" through the Aircraft Carrier Alliance, highlighting the truly national nature of this endeavour. At 65,000 tonnes, HMS Queen Elizabeth, which has been docked at Her Majesty’s Naval Base Portsmouth Harbour for the last few months, marks the return of Britain‘s carrier-strike capability. Carrier Strike constitutes the initial phase of Carrier Enabled Power Projection (CEPP), consisting not only of the carriers, but F-35B Lightning II strike aircraft, Merlin helicopters (some equipped with the Crowsnest airborne radar system), UAVs and amphibious forces. 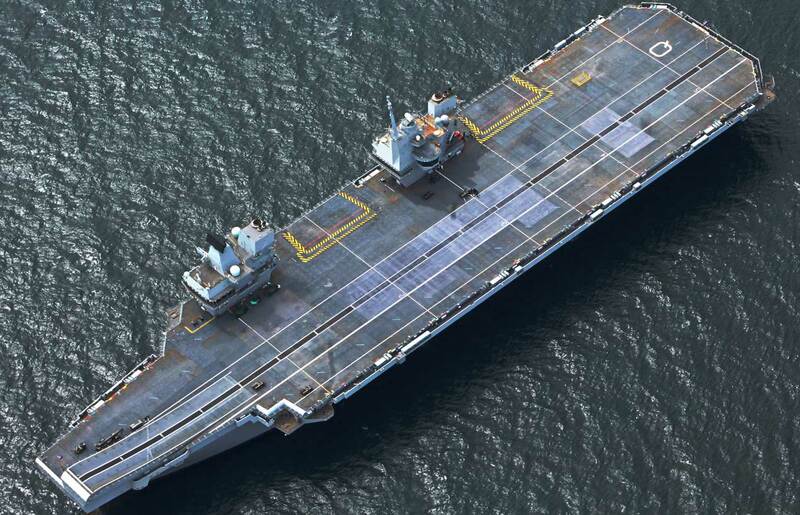 Such an ability to project military power will allow the UK to act militarily without having to rely on foreign basing rights, with the carriers being able to undertake a variety of missions and defence tasks. But as Peter Antill and Pete Ito from the Centre for Defence Acquisition at Cranfield University point out in an article published in our Summer 2017 edition, focusing just on the carriers themselves, without taking into consideration the additional resources, equipment and personnel needed for the Royal Navy to fully realise CEPP, is not the complete picture. They argue that the UK Ministry of Defence will need to refine its operational plans on deploying the carriers so that the additional naval assets are available. According to the National Audit Office (NAO), "for most of the enablers (for example, battlefield helicopters and logistics), the department will need to prioritise its resources to ensure they are available. Most are currently committed to other activities, but without them, the requisite trials and training for Carrier Strike cannot take place." To complicate matters further, Antill and Ito said due to technical issues with their propulsion system, only a few Type 45 destroyers would be available to support HMS Queen Elizabeth on her first deployment, but even that is assuming there are no additional delays. Merlin helicopters currently provide an anti-submarine capability and are in high demand. The Carrier Task Group will need them for both anti-submarine work and to host Crowsnest for airborne radar, but they cannot do both at the same time, say Ito and Antill, meaning that the task group will require a significant number of helicopters, which may not be available for the first voyage. In addition, if both carriers are going to be operated with the UK achieving the full CEPP capability, then it ultimately comes down to having the correct quantity and quality of personnel so that both carriers can be crewed. While technology is vital, the NAO judges that "it is not possible to satisfy all demands" for use of CEPP "with current levels of equipment, budget and personnel." Specifically on personnel, the NAO notes that the MoD "…has a shortage of military personnel, running at 4% below a target strength of 145,560. Key shortages include engineering roles and war-fighting specialists in the Navy and engineering, intelligence, and some aircrew cadres in the RAF. To minimise the impact of these gaps on Carrier Strike, the department is prioritising the capability and carrying out targeted recruitment. However, it will rely on a few people in certain roles to build up the skills and experience needed in time." The NAO goes on to stress that "there will be a lag between personnel being recruited and becoming sufficiently qualified and experienced for their new roles.” The NAO’s analysis is that the MoD "faces challenges in delivering the capability with limited suitably qualified and experienced personnel to operate it." With respect to specific components of CEPP such as Crowsnest, the NAO determines that "the current schedule leaves limited time for integration training and work-up, which could mean that sufficient numbers of Crowsnest-fitted helicopters and trained crews are not ready to protect the carrier group when needed." With regard to F-35B pilots, "the number of pilots will be just sufficient up to 2026, with limited resilience if staff decide to leave the RAF," says the NAO. To read the full article and find out more about the carriers, SUBSCRIBE to our print edition.